Last night saw an amazing local achievement within the justice movement for Ferguson and the supporters of Mike Brown, as well as opponents of police violence and institutionalized racism at large. 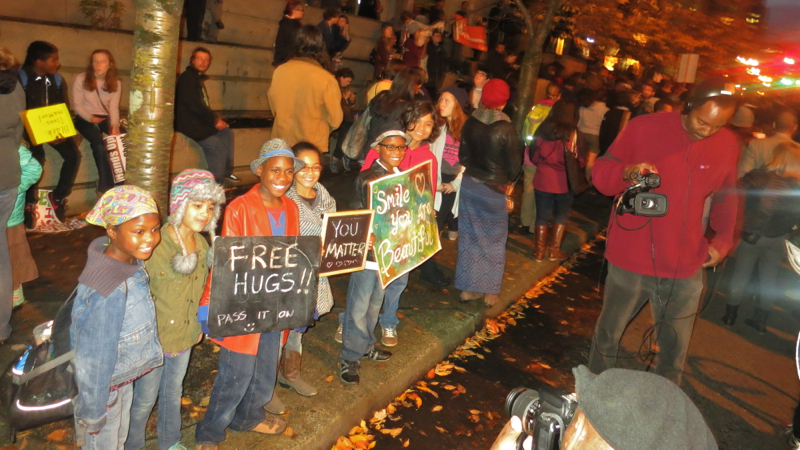 Portlanders, like most the world, have watched events unfolding in Ferguson closely. 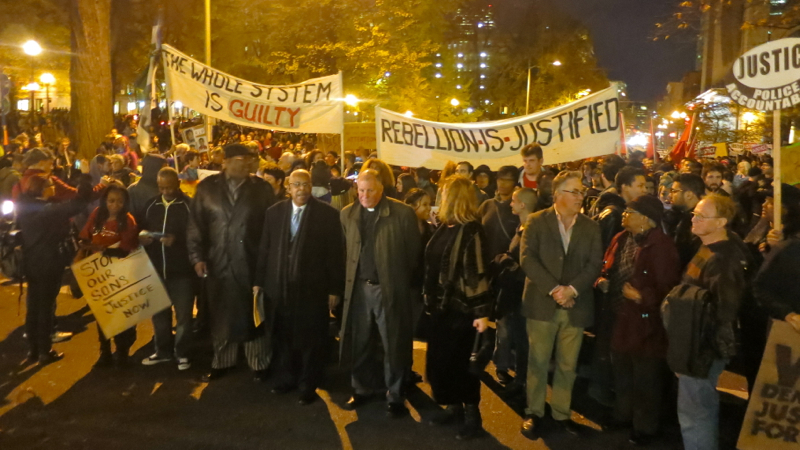 After a grand jury refused to indict Brown’s killer, riots broke out across the nation. Portland is far too passive for lighting cop cars on fire. 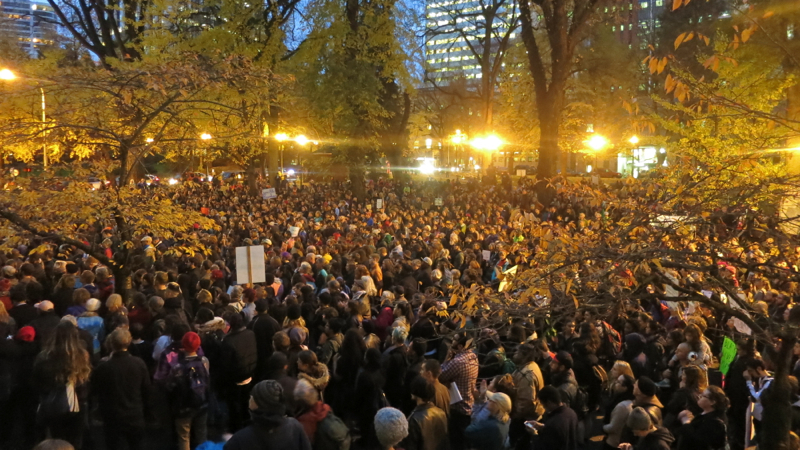 Monday night, though, our city did indeed march without the consent of the Portland Police Bureau, albeit briefly and with only about 200 protesters. It turned out to be but a warmup for Tuesday. A large rally and sanctioned march was ordained by many elder clergy-members and organizations the police maintain a working relationship with. Some 3,500 people showed up, pensive, but calm. Speakers spoke, most of them over 50. Then we marched, briskly, but predictably, around downtown for something like twenty-five minutes. While several of the organizing groups were rooted in radicalism, this event was ruled by the clergy. The grand jury decision whether to indict killer cop Darren Wilson for the execution of Michael Brown could be mere weeks, or even days away. Almost everyone knows there’ll be no indictment – police officers are rarely disciplined for using deadly force, let alone prosecuted. Knowing this, law enforcement agencies have begun flaunting new military weapons as residents also prepare: by way of fashioning homemade defensive shields and boarding up windows. It truly looks as though a hurricane is about to hit Ferguson. That might not be so far from the truth. This is what police state looks like: where the mere idea of unrest elicits hundreds of police to become even more hostile. Imagine if the reverse were true: if we lived in a world where we were all preparing for the guaranteed trial and likely conviction of a white cop for murdering a black teenager – because such an act was universally considered outrageous. Corporate media has played a large role in hyping up the “chaos and violence” angle as they always do. The only ‘chaos’ has been some selectively targeted property destruction of mostly franchise chain stores. The only violence in Ferguson has been inflicted by police. Progressive movements are experts at policing their own behavior. 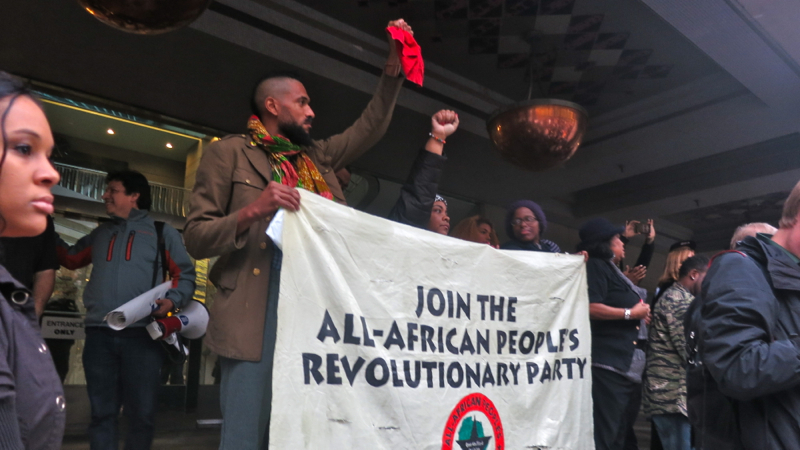 Vast amounts of energy are spent reminding each other to stay peaceful and nonviolent in the face of state violence inflicted by political and economic forces. So often we sabotage our own momentum for fear of being too aggressive in our methods. We retreat and wonder what we did wrong. We struggle to craft the right framing of our own narrative. Language is scrutinized. Introspection drifts into derailment. While purging ourselves of any controversial or ‘violent’ language, we often forget the ways systemic violence plagues peoples’ daily lives. Bicycle/pedestrian advocates have escalated their vernacular with the introduction of the term ‘traffic violence‘; rightfully understanding that the thousands killed each year by cars were victims of a lethal system that rewards motorists with social privilege. Applying this vocabulary to other spheres seems productive, especially where it concerns issues of housing justice. It’s not entirely new, but it bears repeating. Say it with me now: Gentrification Violence. Are Cabbies the Greatest Threat to Cyclists? Last Friday, November 7th, famed cycling filmmaker Lucas Brunelle was attacked and deliberately rammed by a Boston cabbie. The driver, Sam Chandler, fled the scene after repeatedly punching and attempting to run over Brunelle, but was arrested a short time later. While the Boston Globe charactered the altercation as “bizarre”, this kind of violence is disturbingly common among taxi drivers. In a tragic and highly publicized incident in Midtown, New York City in August, 2013, a cabbie lost control of his vehicle, jumped the curb, and hit a young woman, completely severing her left leg off. What was less publicized was the fact that the cabbie crashed after intentionally ramming a bike messenger. This was just days after another Midtown cab jumped a curb after running a red light, seriously injuring several pedestrians. Insanely, there’s actual debate as to whether cabbies should face criminal penalties for maiming or killing people cycling and on foot, and it’s not just in car-crazy United States. In July of 2013, Ichhapal Bhamra drove his cab into 20 year old bicyclist Tom Ridgway, killing him and dragging his body for over 90 yards. Despite this lethal action, Bhamra’s only punishment was a £35 fine. One would think professional drivers whose livelihoods depend on a clean record would be among the safest motorists out there. The idea of a commercial truck driver deliberately running down a cyclist is almost unimaginable – or a mail carrier ramming into pedestrians, it’s simply beyond the pale. Partially concealing a black eye, Brunelle speaks to press after a hearing. The worlds of cycling and activism have a long history of intersecting. In the 19th century, bicycles were a vehicle of liberation for women fighting against disenfranchisement. Swarms of riders also rode to demand safer paved streets, only to see their victories robbed from them by the imposition of the automobile years later. More recently, Critical Mass proved to be a game-changer in how we think about reclaiming streets for people cycling, as well as walking. The concept of a ‘bike bloc’ evolved into ‘bike swarms’ with the inception and ultimate eviction of the Occupy encampments here in Portland. The genesis of the ongoing PDX Bike Swarm inspired the formation of several similar groups across the world. This blog usually only wades into the cesspool of national politics when there’s a local or urban angle. But we did just have a mid-term election – the results of which means less to me than reactions to the outcome does. It’s common for two-term presidents to lose the house and senate in the final years of their administration. Still, there’s been copious disappointment among Democratic party voters stemming from Tuesday’s trouncing. This has confused me, as I’m unclear what it is they feel they’ve lost with a new Republican controlled Senate. Based on the reactions I’ve seen, you’d have thought a major movement of progressive politics had been brought to its knees. You’d have thought the Age of Enlightenment had just come to an end. That’s the funny thing about politics, though; how people standing right next to each other can be living on totally different planets. Hey look! @BarackObama’s finally getting the Republican Senate he’s always acted like he had all along.